South polar region of Venus. 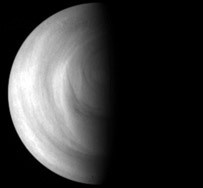 Image in UV by ESA's Venus Express probe. 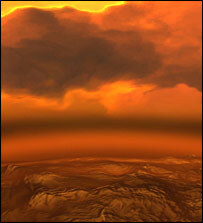 Artist's impression of the surface of Venus. The dense atmosphere of Venus led scientists to believe that it must be 'super-refractive'; that is to say, the rays of light would be bent to such an extent that an observer on the planet's surface would have the impression of being in a vast bowl, with the horizon curving upwards all around them. 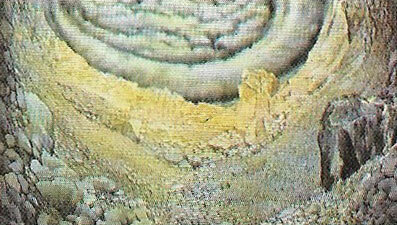 However, the Venera 9 and 10 pictures showed that this is not the case. The atmosphere of Venus does not show the super-refraction that was forecast. Venus has a dense atmosphere, composed chiefly of carbon dioxide, which generates a surface pressure 90 times greater than that on Earth. This massive blanket of carbon dioxide is also responsible for a runaway greenhouse effect that heats the planet's surface to an average temperature of 467°C (872°F) – hot enough to melt lead. 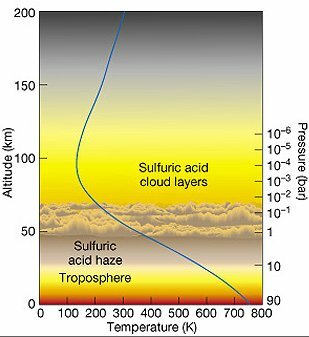 Venus' atmosphere consists almost entirely (96.5%) of carbon dioxide, with clouds containing droplets of sulfuric acid along with compounds of chlorine and fluorine. These precipitate an acid rain called virga, which evaporates before it has the chance to reach the surface. In the upper part of the atmosphere, clouds swirl by at a rate of 300 kilometers per hour, driven by fierce winds. That Venus was permanently enveloped in what appeared to be thick, white clouds soon became clear following the development of the telescope. By analogy with Earth, it was generally assumed that these clouds were made of water vapor, a conclusion supported by early spectroscopic studies by Secchi. The main composition of the atmosphere remained a matter for conjecture until spectroscopic observations by Walter Adams and Theodore Dunham, in 1932, established that it was carbon dioxide. Speculation about the make-up of the clouds continued. In 1937, R. Wildt suggested methanal (formaldehyde), while in 1954, Fred Whipple and Donald Menzel proposed ice crystals. Today, they are known to consist primarily of sulfuric acid. In the May 2008 issue of Astronomy & Astrophysics, Picconi et al. report the first detection of the hydroxyl (–OH) radical in the night-side airglow emission of Venus. The discovery was made using an instrument onboard Venus Express. This is the first detection of –OH in the atmosphere of a planet other than Earth. It is important because it will give new insight into the dynamics of the upper atmosphere and the climate system of Venus. Although the surface of Venus swelters at an average temperature of 467°C, and much of the planet's atmosphere is also hot, there is a layer within the atmosphere that is surprisingly cold – colder, in fact, than anywhere in Earth's atmosphere. At an altitude of about 125 kilometers above the surface, measurements by the Venus Express probe have shown, the temperature drops to an amazingly low -175°C, cool enough in theory for carbon dioxide ice or snow to form. 1. Mahieux, A. "Densities and temperatures in the Venus mesosphere and lower thermosphere retrieved from SOIR on board Venus Express: Carbon dioxide measurements at the Venus terminator." Journal of Geophysical Research, vol. 117, E07001, 15pp (2012).